Here are two cards for the athletes-as-character-actors category, with two others posts found here and here. I love this first one. One of my favorite things of all-times is the Bad Boys Pistons teams. I cannot express to you how big of a fan I am of that particular group. Isiah Thomas was my hero. After Isiah came Bill Laimbeer; probably the most reviled athlete outside of the Metro Detroit area. Say what you want about Bill but he was one of the most cerebral competitors of all-time. He knew how to get under the opponent’s skin to the point where their mind wasn’t on the game but focused on getting at Bill. He knew his role and played it like a song. Plus, I have to believe he was the original stretch five and a helluva rebounder for a guy who barely got off the ground when he jumped. 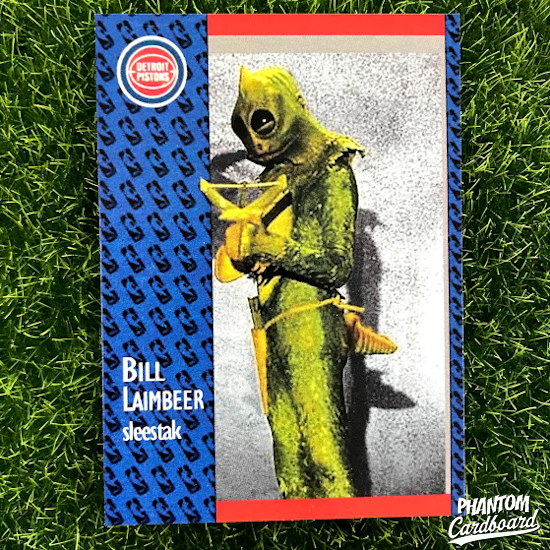 I guess that’s enough of me waxing poetic about Bill Laimbeer the player, let’s get into the card and Bill the Sleestak. In 1974 Bill was 17 years old and a high school student at Palo Verde High in California when the Saturday morning kid’s show Land of the Lost came calling for vertically advantaged persons to fill their Sleestak costumes. I’m not 100% sure what a Sleestak even is but I’ll just assume they must go hard in the paint. For the card I choose a design inspired by the 1991-92 Fleer basketball cards. These were never my favorite basketball cards. The only thing I think that they had going for them, in my opinion, is that they were better than Fleer’s horrendous 1990-91 offering. Blek. I didn’t go with a 1974 design because I wanted it to be a mash of one of Bill’s Pistons cards. I thought that this card design would work because of its tall, slender picture area fitting the picture I chose to use. 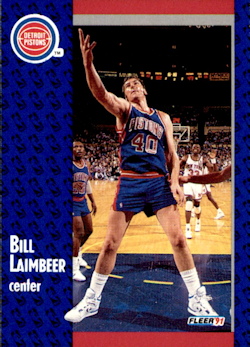 I prefer this to Laimbeer’s regular card from this set. I always thought they selected the weirdest looking picture of Bill that they could find. What’s going on on it? Is he doing Shakespeare? This one is a fun one too. For those that didn’t know, Lotney “Sloth” Fratelli was played by former NFL defensive back John Matuszak. The 6’7” near 300 lb. giant of a man was selected first overall in the 1973 NFL draft by the Houston Oilers. Matuszak could described as colorful and wild. His self destructive tendencies caused him to bounce around to a few NFL teams until finding a home signing with the Oakland Raiders in 1976. The Raiders have been known throughout the years to be somewhat of a bastion for football players with ability on the field but present a challenge off of it. 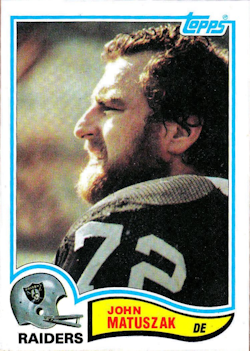 Matuszak kept the volatility in check enough to help the Raiders win two Super Bowls before retiring in 1982. John Matuszak died 1989 of an accidental prescription drug overdose. 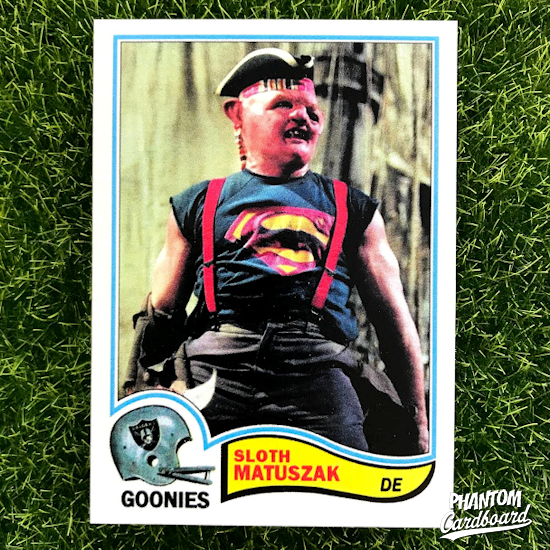 Topps did make a card set for The Goonies, but this is a little different being a mash of iconic Sloth character and the real life football wildman who played him. I chose to use the design for Matuszak’s last regular issue card, the 1982 Topps. First and foremost it had to be a Raiders card. It’s where John Matuszak found success in the pros spending seven of his ten years in the league in Oakland. The first time Chunk encounters Sloth the character can be seen wearing a Raiders t-shirt, no doubt an homage. Second a Raider is a pirate and The Goonies is centered around the quest to find lost pirate treasure.